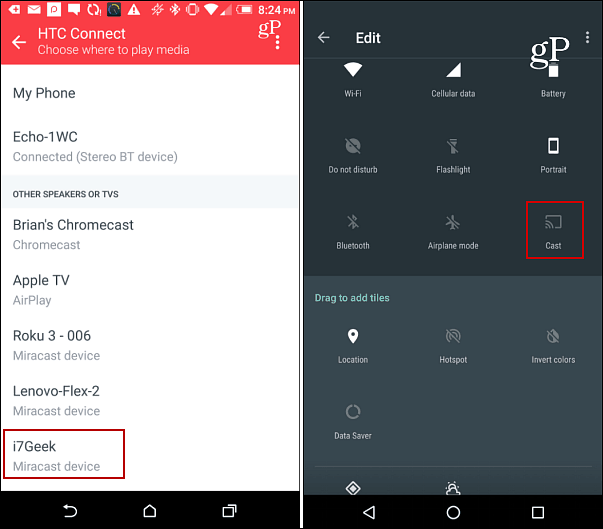 There are several ways to cast your Android screen to a large screen via Google’s Chromecast or other set-top devices like Roku. 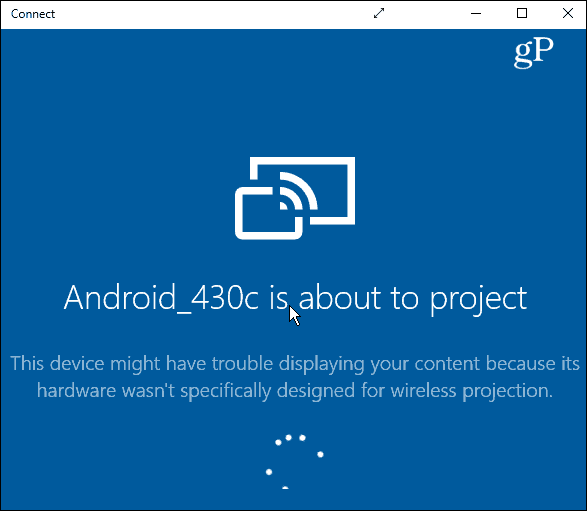 But what if you run into a situation where you need to mirror your Android to a Windows 10 PC? If you’re running Windows 10 Anniversary Update edition or higher, you can do it using the built-in Connect app. There are a few things to mention about this before we start. Both devices will need to be connected to the same network. 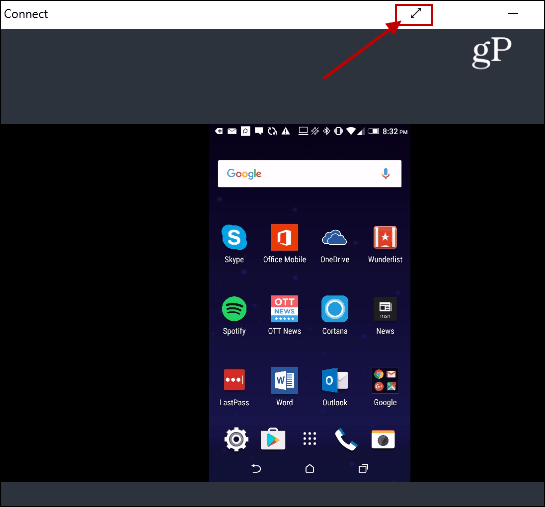 And while the Connect app is included in Windows 10, your results will vary depending on your mobile device and version of Android it’s running. The Connect feature uses the Miracast standard. So, for this article, I’m using the HTC One M8 which comes with HTC Connect. It supports Miracast as well as several other streaming media standards like DLNA and Bluetooth. Press the Windows key and type: connect and choose the trusted Windows Store app result from the top. On your Android phone swipe down with two fingers from the top of the screen and select the Cast icon and select your PC. Note that it will vary here between device8s. On some phones, it will be a button labeled ‘Cast’. Others might say ‘Screen Mirroring’ or in my case – HTC Connect. If you don’t see a cast or mirroring option, you probably need to edit the quick settings menu and rearrange the icons. 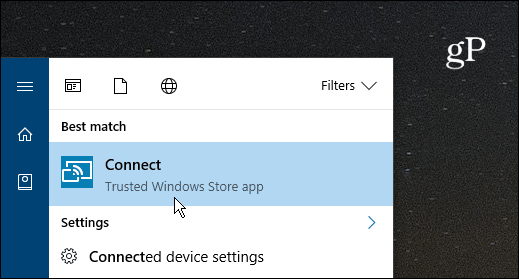 You’ll see a connection notification on your smartphone and on your Windows 10 PC in the Connect app window. Once the connection is established (it should only take a few seconds) you will now see your Android screen displayed in the connect app. You can keep it in the windowed mode shown below, or blow it up by selecting the arrow icon on the title bar. 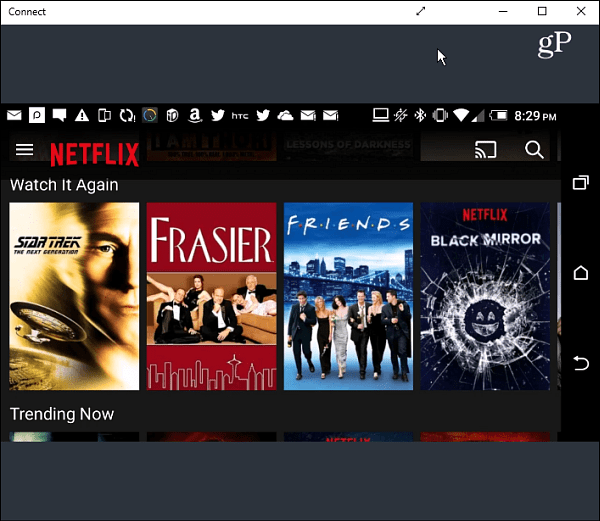 It’s worth noting that it will display your Android screen in portrait mode and landscape if you launch an app that supports that such as Netflix which you can see in the example below. While you probably won’t use this method a whole lot. It will come in handy if you have something on your Android phone that you want to display to Windows 10 during a business presentation in a pinch, though.